Press Conference on Launch of India by the Bosphorus press conference was organized by the Embassy of India at Hilton SA, Ankara on the upcoming festival of India, India by the Bosphorus. Turkeys Deputy Minister of Culture and Tourism, AhmetHalukDursun, was the chief guest at the event. The Head of Division, the Directorate General of Cultural Affairs and Overseas promotion in MFA, MrBahriBatu was the guest of Honour. The Indian Ambassador Sanjay Bhattacharyya revealed that the festival titled India by the Bosphorus,will be held in cities of Ankara, Konya, Izmir and Istanbul. HalukDursunstressed upon the importance of culture as a way that societies integrate. He said that the cultural richness of India, has aroused the curiosity and interest of the people of Turkey.Sanjoy Roy, managing director of Teamwork Arts, said Turkey and India have much in common, from literature to architecture, food and dance.Roy said a reason for Indians to choose Turkey as an international route for weddings is that India finds Turkeys culture similar to its own and Turkish people are efficient to work with and hospitable. Leading artists of India will present performances during the fourday festival, which will showcase the diversity of India. 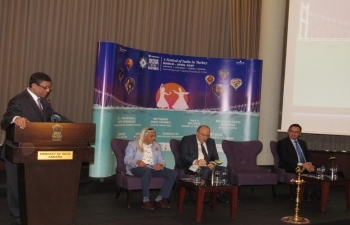 The festival will be held from March 2024 and April 1528 in the cities of Ankara, Konya, Izmir and Istanbul. 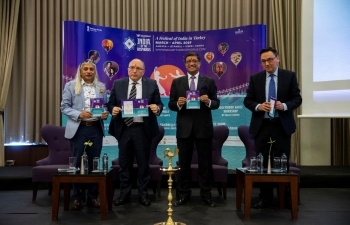 The Brochure of India by the Bosphorus was launched by the dignitaries.